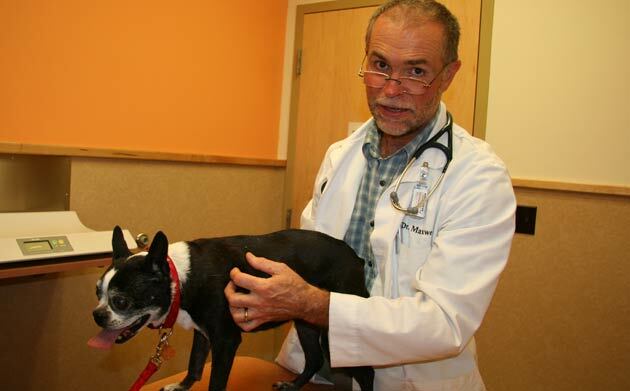 Meet a doggie doctor who’s built solid relationships by listening carefully to his two-legged clients and their four-legged friends. Missy, a Boston terrier, stands on an examination table at Dogwood Petcare Center, 4102 N. Mulford Road, Loves Park Ill., as owners Jerry and Lisa Lindmark support her. Their veterinarian, Dr. Andy Maxwell, strides in and greets everyone warmly, starting with Missy. As he soothes the shaky dog, whose toenails slide occasionally on the linoleum surface, he visits with her humans. The three discuss the Lindmarks’ son and his boisterous pug for a few minutes. Then, the chit-chat subsides as the examination of Missy begins in earnest. The 15-year-old dog suffers from a chronic skin condition that Maxwell’s been treating. He runs his hand the length of her spine and stands her up on her hind legs to examine her belly. “How’s she been doing with the scratching and chewing?” he asks. As Lisa describes improved symptoms, Maxwell listens attentively and checks under Missy’s flanks and between her pads. “She’s looking 100-percent better underneath,” he says. “Don’t you think so?” He motions for the owners to look for themselves, and makes certain that they agree with his assessment before continuing. “But we don’t want to let up. Her skin is still pretty flaky. How’s she handling the antibiotics? Any stomach upset?” As he talks, he listens to the dog’s heart and examines her eyes, ears and teeth. After getting the rest of the details on Missy’s behavior in the two weeks since her last visit, Maxwell explains that he’ll give her a booster shot and replenish the Lindmarks’ supply of pills for her. He suggests a follow-up appointment but assures them that they can call if anything changes in the meantime. They share more small talk, and then Maxwell checks to see if either has remembered anything they wanted to ask before he says goodbye. After charting his session with Missy Lindmark, Maxwell moves on to his next appointment. His day is packed, with patients scheduled in 15-minute increments from open to close. But this vet is no clock-watcher, a quality he believes has helped to make him successful. Maxwell owns and manages Dogwood, a multi-unit facility providing boarding, doggie day care, grooming and veterinary care. Among the hospital services offered: diagnostic and internal medicine consults; radiology; surgery and anesthesia; in-house pharmacy and laboratory; dentistry; behavioral consultation; and emergency care. Maxwell is a farmer’s son with a lifelong love of animals, who started his career with a mixed animal practice in his home state of Arkansas in 1982. He then moved to Prairie du Chien, Wis., for a couple of years, before settling in Rockford in 1987, to be near family members. He shifted his focus to small animals for several reasons. That office was located in a 1,500 square-foot space in a strip mall on Riverside Boulevard. “There were no windows,” says Maxwell with a grin. “There were days I never made it out the door, and I had no idea what was going on outside. I came to work in the dark and left in the dark. I was very busy. As he started his expansion, Maxwell took a careful look at the pet care market. The veterinary hospital is 4,765 square feet, and the kennel with grooming facility is 10,900 square feet. Maxwell employs 16 people at the hospital and 16 at the kennel. Maxwell shows off his newly redesigned operating room, with two tables and top-of-the-line tools, and in another room, a digital x-ray system. “This is amazing,” he says. “The images are high-quality, and we can adjust the contrast and brightness to get an even more accurate picture of the injury or condition. Since coming to Rockford, Maxwell has seen some families through four lifecycles of pets, and he’s now treating pets of clients who first came in as children. In the Lindmarks’ case, it was the reverse. Greg, who just retired as a deputy chief for the Rockford Police Department, first brought the police dogs to Dogwood, and then his own dog; soon, his parents followed. This entry was posted on Friday, October 14th, 2011 at 11:59 am	and is filed under Northwest Business Magazine. You can follow any responses to this entry through the RSS 2.0 feed. Both comments and pings are currently closed.